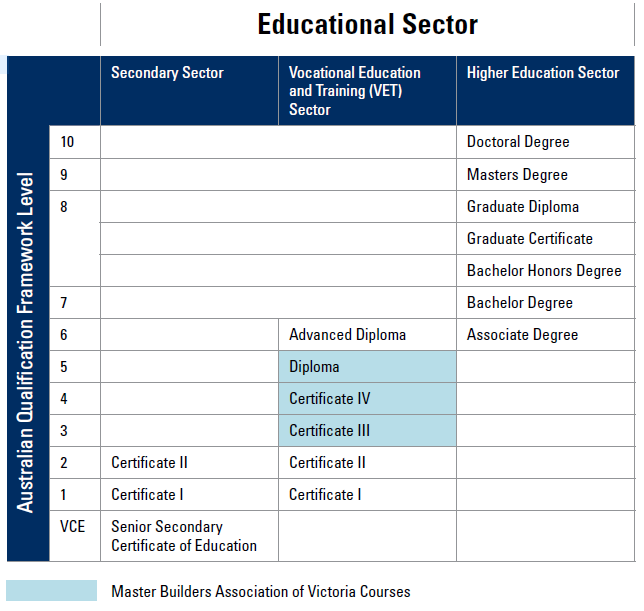 Master Builders Association of Victoria (RTO number 3935) offers qualifications that are recognised under the Australian Qualifications Framework (AQF). The AQF is the national policy for regulated qualifications in Australian education and training. It incorporates the qualifications from each education and training sector into a single comprehensive national qualifications framework. The AQF was first introduced in 1995 to underpin the national system of qualifications in Australia encompassing higher education, vocational education and training and schools. AQF programs are nationally recognised, which means your qualification and skills can be used anywhere in Australia and may also provide you with credit points towards further study. For information about our qualifications please visit our course pages or contact Master Builders on (03) 9411 4555.